It’s quick and easy to setup. 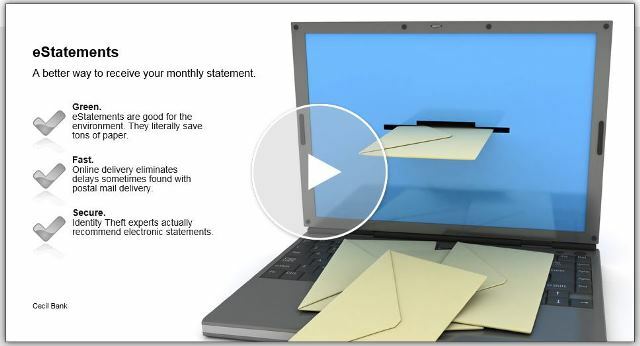 You can view your account statements from your home or office computer. You will receive paperless account statements that can be viewed and saved to your computer for unlimited access in the future. The best thing about it. It’s FREE. 2. Come in to your closest branch and the branch personnel will assist you in registering for eStatements. How do I know when my bank statement is available for viewing? The eStatement system will send an email notification to you, complete with a link to the eStatement website. Will I still be receiving images of my checks? You will be receiving your imaged statements as you receive them today in paper form including the images of your checks. Once you sign up for eStatements, you will not be receiving a paper statement. How do I save my bank statements for future viewing? Once you are viewing the bank statement, you would click on Save A Copy or click File and Save as to save the file for future viewing in the Acrobat Reader. You have to change the name of the file (i.e. 2010-12 Bank Statement.pdf) and store it on your computer where you can find it in the future. What are the system requirements for using eStatements? 1. A personal computer, laptop, or tablet. 2. A connection to the Internet (an Internet Service Provider accessed by your computer). 4. At least one checking deposit account with our bank. 5. You must have a valid, working email account to receive notification that your eStatements are available for viewing. 6. You must have the free Adobe Reader software which can be downloaded from the link noted above. No. Only you can log-on to your accounts through the eStatements system. All of your account information is kept on our computers and the information transferred to your computer is done over a secure connection. If I am having trouble logging on, what might be the problem? Always remember that your password is case sensitive. Make sure “Caps Lock” is off and try again. If you still are having a problem or have forgotten your Password, contact our eStatements Coordinator at 410-398-1650, ext. 214 or 235. How is your password established? When you set up the service, you will be prompted to establish your own personal password. Your password should be established with both letters and numbers. Please avoid the use of any portion of your name, family names, social security number, address or phone number. Why do I need an Internet Service Provider to use the eStatements System? The Internet Service Provider (ISP) ensures that your computer conforms to internet protocol and this protocol is essential for secure connections between your computer and our service. Is the Internet safe to review my banking information? Yes. We use 128-bit encryption: Secure Socket Layer 3.0 (SSL) for all communications. This is currently one of the highest levels of security available for Internet Transactions. Still Need Help? Call our eStatements Coordinator at 410-398-1650, ext. 214 or 235 or any of our convenient branch locations. We’re here to serve you!